In this privacy statement of Segway Rotterdam you will learn how we handle your personal data that we collect. We will describe how we collect your personal data and how we use them. Furthermore, you will learn your rights regarding these data and how you can use your rights. The website of Segway Rotterdam collects your data to optimize our offer and the website. For this, Google Analytics is used. The data that is saved, is anonymous. A couple of things are saved, such as the duration of your website visit, the buttons you click on and how you end up on our website. All data will only be processed with your explicit consent. The storage of your data in MailChimp is for an indefinite period of time. At all times you can unsubscribe through the link at the bottom of the newsletter or by sending an e-mail to info@segwayrotterdam.nl. The personal data that is managed by Segway Rotterdam or by the aforementioned third parties is only accessible through the mentioned software and is protected by a password. Devices, such as computers and tablets, that open your data are all locked with a password and/or fingerprint. The reservation lists with names and reservation information of the guests can be printed. After the outing these lists are destroyed. Your visit to our website is secured by a SSL certificate. It means that your connection to the website of Segway Rotterdam is private. You recognize this protection by security by the green lock at the top of the URL-bar. At all times you are entitled to request your data that has been stored with us. 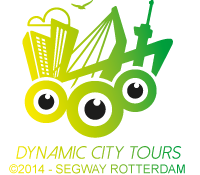 For this you can send an e-mail to info@segwayrotterdam.nl. If you want your data to be no longer registered with Segway Rotterdam, you have to right to have your data deleted. You have the right to file a complaint with the Dutch Data Protection Authority if you feel that Segway Rotterdam doesn’t handle your data correctly. Please, use this link. You can make use of these rights by sending an e-mail to info@segwayrotterdam.nl. Segway Rotterdam processes personal data on the basis of a legitimate interest, namely a commercial interest. You can think of owning your reservation data and offering are services by e-mail. We will never sell your data to third parties. The data we require is the minimum data for providing services. If you don’t supply this mandatory information, Segway Rotterdam can’t offer the relevant service. We require for example your phone number and e-mail address so we can inform you if an activity is unexpectedly cancelled or if we have questions about your reservation.